When I first started kayaking I was one of those people that would use anything heavy as a kayak anchor. I brought along old dumbbells, cinder blocks, metal plates, rocks, you name it. It was only over time I realized that an anchor doesn’t have to be heavy to do a good job. In fact the best anchor is going to be light enough not to weigh you down, but heavy enough to keep you securely in place. Simply put, the anchor scope is the proper ratio of water depth to anchor line needed to securely keep your boat in place. Typically the suggested ratio is 7:1 which would indicate that for every 1 foot of water depth the anchor line out should be 7 feet. This is a bit excessive and would require 42 feet of anchor line out if you’re in 6 feet of water, which is quite a lot. 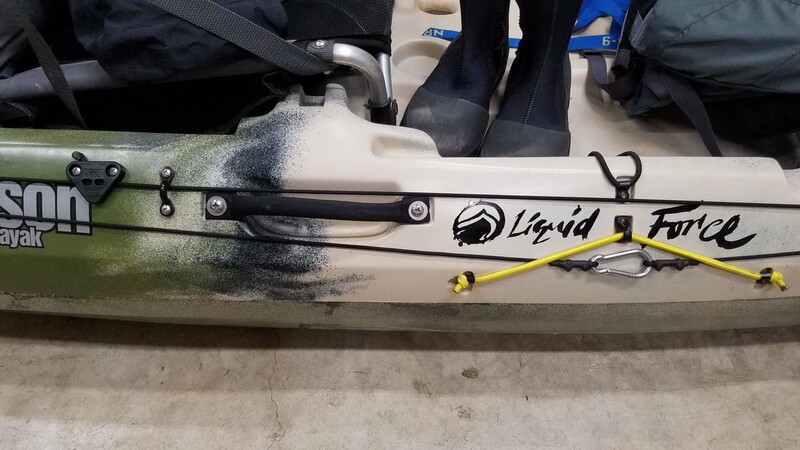 If you want to do that then go for it, but you can get away with anything from a 3:1 – 7:1 ratio to hold your kayak firmly in place depending on the wind, tide, and bottom composition. Maybe use the 7:1 ratio as the max amount of line you carry with you. If you need more line than that then the water is going to be moving too fast to anchor up safely. The weight of the anchor is fairly inconsequential when it comes to holding a kayak in place. The anchor design and your anchor scope is going to impact the hold much more. As a rule of thumb I would suggest something that is anywhere from 1lb – 4lbs so it is light enough to paddle and heavy enough to get a solid grab on the bottom. An anchor trolley is the rigging attached to the side of your kayak that directs the anchor line and lets you move it from bow to stern depending on the wind and current. The perfect anchor trolley setup is very personal as far as what clips and pulleys to use and where to run the lines on your particular kayak. I’ve designed my own anchor trolleys with stainless steel hardware and Harken micro pulleys which has served me very well, however one pre-built system that I’ve found to work very well is the YakAttack Leverlock Anchor Trolley. It comes with everything you need and the pulleys are very low profile and will not get caught up on your fishing line. The claw anchor or bruce claw is my favorite kayak anchor and the one I carry on all my kayak fishing trips. I’ve used all of the anchors on this list and I can say without a doubt that this has consistently provided the most secure hold for the lightest weight. In fact I typically have to pull my kayak back to the anchor to get it free, that’s how well it grabs the bottom especially in sandy or soft muddy bottoms. It is actually surprising that you don’t see this one sold in stores as often as the grappling anchor, but that is likely due to its shape being a bit less compact than other anchors. I will admit that I sprung for the more expensive stainless steel version of this anchor. I can also admit that when I inevitably lose that beautiful and expensive anchor, I will probably cry. The grappling anchor is an extremely popular and excellent choice for a kayak anchor. 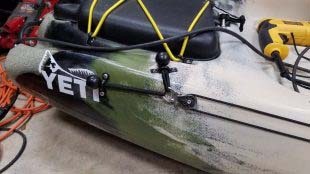 It is affordable, readily available, compact, and does a good job of holding the kayak in all but the swiftest of currents. The anchor has four prongs that fold out to grab the bottom and it works well on rocks, weeds, mud, or sand. This is the original anchor that I started off with and it does a great job and is very compact which is nice especially on a kayak and why I would imagine it is one of the more popular anchors you see kayakers using. A stakeout pole or pin anchor can be brilliant when you’re fishing shallow inshore waters with a soft sand or mud bottom. It is stealthy, easily deployed, and can double as a push pole. The only limitation here is the water depth you’re fishing in. Be sure to still use an anchor trolley with this and don’t anchor the pole through your scupper holes. It seems like a logical place to put the stakeout pole, but the scuppers are the weakest part of your kayak and the torque put on it by a rocking boat can easily open up a crack and ruin your day. My suggestion for a pin anchor is to get something light, made of fiberglass or carbon fiber such as the YakAttack ParkNPole. It has a float on one end to prevent it from sinking, and a solid handle to anchor into the ground or flip over for poling. Also be sure to consider a clip kit or another method to secure it to your kayak while paddling. Drift chutes are a great idea if you’re in open water and tarpon fishing. It you don’t want to fully stop but you want to have a slower drift then hang a drift sock from the back of your kayak. It will grab water and slow you down. Most anglers use these when fishing offshore to put pressure on a big fish and prevent their kayak from being pulled miles offshore. A 24” to 36” size is perfect for a kayak and it is easily stowed in your milk crate or hatch when not in use. Only use this in deep open water and have a plan to cut it loose if needed. You can get into a lot of trouble very quickly if you get hung up on a swift current. The reinforced nylon material on the Lindy Fisherman Series Drift Sock is very strong and holds up well to rough water fishing. What is the Best Type of Kayak Anchor?